During her 16–year tenure, Congresswoman Mary Rose Oakar was dedicated to improving the economic welfare of women. She led the charge in Congress for women’s rights, though she often came into conflict with national women’s groups for her staunch pro–life position. Representative Oakar became an influential figure in the Democratic Party, climbing the leadership ladder by mastering House internal procedures and administration. In the 95th Congress (1977–1979), Oakar served on the Banking, Finance, and Urban Affairs Committee, and she introduced successful legislation to commemorate the work of suffragist Susan B. Anthony by creating a $1 coin featuring her likeness.4 She eventually chaired the Banking Subcommittee on Economic Stabilization. 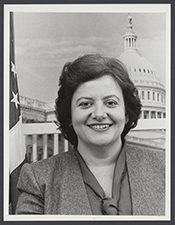 Oakar subsequently was appointed to several more committees, including the House Select Committee on Aging in the 96th Congress (1979–1981), the Post Office and Civil Service Committee in the 97th Congress (1981–1983), and the House Administration Committee in the 98th Congress (1983–1985). She served on these committees through the 102nd Congress (1991–1993). Oakar developed a reputation as a liberal who worked on behalf of women’s rights issues, especially economic parity. “Economic security is the truly liberating issue for women,” she said. “If you’re economically liberated, you’re free to pursue other avenues in your life.”5 As chair of the Post Office and Civil Service Subcommittee on Compensation and Employee Benefits, she sponsored two bills during the mid–1980s: the Pay Equity Act and the Federal Pay Equity Act. Both revived a longtime effort among women in Congress to achieve salary equity with men for employment of comparable worth. Charging that “employers have used gender as a determining factor when setting pay rates,” Oakar stressed the need for a comprehensive study investigating pay discrepancies between men and women both in the private sector and in the federal government. After Congress, Oakar was indicted on charges of receiving illegal campaign contributions. She pled guilty in March 1995 and received two years’ probation, community service, and fines.14 Oakar’s work on behalf of the elderly continued, however, as President William J. Clinton appointed her in 1995 to the 25–member advisory board for the White House Conference on Aging. She went on to work as a business executive and consultant. Oakar was elected to the Ohio state house of representatives, where she served from 2001 to 2003. In June 2003, Oakar was named President of the American Arab Anti–Discrimination Committee. 1Michelle Ruess, “Oakar’s Loss a Blunder, Not a Coup,’ 8 November 1992, Plain Dealer: 1B; Karen Foerstel, Biographical Dictionary of Congressional Women (Westport, CT: Greenwood Press, 1999): 209. 3“Mary Rose Oakar,” Associated Press Candidate Biographies 1992; “Election Statistics, 1920 to Present,” http://clerk.house.gov/member_info/electionInfo/index.aspx. 4Congressional Record, House, 95th Cong., 2nd sess. (14 June 1978): 17712; Congressional Record, House, 95th Cong., 2nd sess. (11 July 1978): 20139; Congressional Record, House, 95th Cong., 2nd sess. (14 July 1978): 21044. 5Steven V. Roberts, “Of Women and Women’s Issues,” 8 October 1985, New York Times: A20. 6“Equal Pay Bill Labeled Anti–Family,” 5 April 1984, Washington Post: A4. 7Juan Williams, “Retorts Traded in Hill Hearing on Comparable–Worth Issue,” 5 April 1985, Washington Post: A2. 10Chuck Conconi, ‘Personalities,’ 6 December 1988, Washington Post: E3. 11Karin Schulz, “‘Mary Rose’ Takes Old–Fashioned View of Campaigning,” 20 September 2001, Cleveland Plain Dealer: B1; Adam Clymer, “Congresswoman Is Facing Difficult Challenge in Ohio,” 27 May 1992, New York Times: A19; Susan B. Glasser, “How Did Mary Rose Pull It Off?” 8 June 1992, Roll Call. Previously, in 1987, the Ethics Committee reprimanded Oakar for having kept a former aide on the payroll two years after she had left Oakar”s office, and for giving another aide a $10,000 pay raise at the time that she and Oakar bought a house together. Oakar repaid the money and survived the incidents largely unscathed. For information on the reprimand, see the Committee on Standards of Official Conduct history of disciplinary actions at http://www.house.gov/ethics/Historical_Chart_Final_ Version.htm. 14“Ex–Congresswoman Denies Seven Felonies,” 5 March 1995, New York Times: 14. Videocassette: 1988, 4 commercials on 1 videocassette. The commercials were used during Mary Rose Oakar's campaign for the 1988 U.S. congressional election in District 20 of Ohio, Democratic Party. "Mary Rose Oakar" in Women in Congress, 1917-2006. Prepared under the direction of the Committee on House Administration by the Office of History & Preservation, U.S. House of Representatives. Washington: Government Printing Office, 2006. The Honorable Mary Rose Oakar discusses advice she received from Congresswoman Geraldine Ferraro after she was elected secretary of the Democratic Caucus. The Honorable Mary Rose Oakar explains how she made history at a White House meeting. The Honorable Mary Rose Oakar explains her role in building support for a women’s caucus.